Press the ON button on the UR monitor. Which normal and no actions are necessary for this. During boot you will see various screens loading and checks – this is normal and it takes 1 – 2 minutes to boot. You will also hear the fans turn in the controller box. After booting the monitor will show one of these two screens depending on if the Emergency push button has been pressed. If the emergency messages are shown – then turn the red mushroom button clockwise. Then press the “OK” on the screen. It is also possible to use the mouse and click on the OK or “To Initialization Screen”. From this stage on and the rest of the manual a mouse click is used instead of pressing the touch screen monitor if not mentioned otherwise. (The mouse click or press with finger has the same result). This will take you to the “Initialization” screen because at this point just after a cold reboot the robot does not know where the joints are situated. This also apply if the robot has been used and programmed before – after a cold reboot this initialization is necessary for the robot to find the position of the joints. Notice that the screen say “Power OFF” and all six lamps for the joints are yellow. The controller has power ON of cause, but the robot is still Power OFF. Press the “ON” button to turn on the power to the robot. The status will go to “READY” for each joint, but the lamps are still yellow because the position of the joints is still unknown to the robot controller. Press the “Start” button. You will hear six clicks – click – click – click – click – click which are the mechanical breaks inside the joints that are releasing. The mechanical breaks are use in transportation and after an Emergency stop to ensure the robot joints do not move. The robot does still not know the position of the joints and we have to help the robot on the way in order not to crash into something (including into itself) when the robot starts moving. Because we have just unpacked and the robot is folded together in a tight position we will use a very controlled method this first time. Later we will see how a shortcut can be made when the robot is cold started for a position where the robot is fairly free and unfolded. In this position we need to make sure the robot is moving “upwards” so it is not crashing into itself. If it crashes into itself it will stop with a safety stop, but the robot could be slightly scratched and we want to avoid that especially when it is new. The robot is a 6 axis robot which means it has six joints and six axis freedom of movement. The joints are named 0, 1, 2, 3, 4 and five counting from the base – or with names it is Base – Shoulder – Elbow – Wrist 1 – Wrist 2 – Wrist 3. So in this case we want the elbow joint to move upwards to make the robot freer. 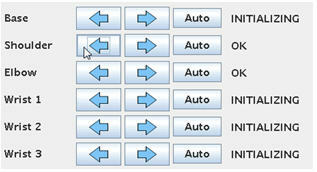 So press and keep pressing the arrow pointing right – look at the photo at the right where to mouse pointer is placed. Keep pressing and you will see the robot rise upwards. After a few seconds the “Elbow” joint will report “OK” on the monitor. This means the robot now knows where this joint is positioned. It is not necessary to turn one full circle. What you see on the photo is normal. Now we want the “Shoulder” joint to move upwards in order to get the more upright and if turning down we might crash into the table if the robot sits on a table. Press the arrow pointing to the left for the “Shoulder” joint. You will see the robot move further upwards by the “Shoulder” joint movements. After a few seconds the “Shoulder” joint will also report “OK” and the position of the joint is now know to the robot controller. Now the robot is already quite good up and free so for the last 4 joints we will use a faster method. Press the “Auto” button on top of all joints where it says “Robot”. Keep pressing the “Auto” button. Now notice how the remaining 4 joints all move until all of them say “OK” which means the robot has been Initialized and all joint position are know to the controller. This “Auto” method is actually possible for all 6, but since the robot was folded we choose this controlled method until the robot had more space. We will try that very soon the second time we start up the robot. All the joints on the monitor reports “OK” and notice how all the lamps turned green. The robot is now initialized and ready to be programmed or load a program if we already have made a program before. Press the “OK” button at the bottom of the screen which takes you to a Main Menu screen. Try and press the “About” button. A screen with software version information appears and if an IP address has been assigned it is also shown in this screen. We will learn later how to set an IP address so this is properly blank on your screen. Press “OK” and you will return to the “Main” menu. For training purpose the shortcut method for initializing the robot will be explained now because the robot is already up and free. 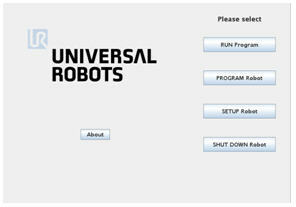 So shut down the robot by pressing the “SHUT DOWN Robot” button. Confirm the Shutdown by pressing “Yes” button. After a few seconds the robot and controller are turned off. Notice how the six clicks could be heard because the mechanical breaks engaged to make sure the robot does not fall uncontrolled down to the floor. Turn on the robot for the second time. Turn on the robot again following the same procedure as explained above until you reach the “INITALIZING” screen. Since the robot is up and free then press the “Auto” button on the top where it says “Robot”. Press only briefly (0.5 – 1 second) and notice which direction the robot moves. Press again only briefly (0.5 – 1 second) and notice again which direction the robot moves. This is useful if the robot was power off near some obstacle or inside a machine – then we can control the movement direction during initializing because alternate press will cause the robot to go in opposite direction. When you know the direction of movement you wish the robot to go during the initializing procedure then keep pressing until all joints report “OK”. This time the initializing procedure went much faster and this will often be the choice of method during a cold reboot of the robot. Press the “OK” button at the bottom of the screen to go to Main menu. after the question about remote On/OFF of the UR10e robot, we hit the wall if we try to power on the robot when the system is pluged into the power cord; in our case the robot is battery powered and when the system switch is ON, we need an automatic power on of the robot. Is there a simple solution or we need to provide a step on the Remote ON pin at main power on? we are using UR10e with battery supply. Is there a possibility to switch UR10e ON with external signal and also to switch it OFF. Thank you for any suggestions. The User manual for UR10e chapter 5.4.7 does mention a Remote ON/OFF control. I have been wondering, is there is a function I could use to make the system power off by itself? I couldnt find any information about it. My UR10 has a pretty long process to do so after the shift is done it will be set to continue work over one more pallet and then finish the program. Since noone will be around to turn power off, he will stay on untill next morning. I think some external circuit has to be made – it is for example possible to send a shutdown command through the Dashboard server. I am having a problem with my new UR5. I have been setting it up this week, which seemed to have gone well. Yesterday I was trying to communicate with it using the robot operation system (ROS), which after a day of searching various websites and gits, also seemed to go well, although I never got to actually move the robot via my computer before I had to go home. This morning I have tried to power on the UR5 but have been getting the following error messages on the initialisation screen. Then: C201A0: Setup of safety board failed. Also in the log, I found an extra code: C102A0: Real robot not connected, – Simulating robot. I do not have experience for ROS on the UR robot and the error messages seems like something has been corrupted in the process. Maybe consider to contact your robot proveider. im using an ur3 and an ur5 in one machine. they communicate over modbus. now i want to start both by just using one tablet. could you help me in that case? One teach pendant cannot be used entirely to control two robots because it is by nature two different machines with each their safety system etc. Maybe it can be considered to make the program so an out put is set to and input on the other robot to make a start synchronized. I am using an UR5 that worked completely fine for several weeks prior to today. There was a power outage when turning on the control box. After this the TP wont even start, note: it never got as far as to start as the power went out maybe 1 second after turning it on when the outage happened. Now, when i press power on the TP, the no cable message pops up, but instead of booting the TP simply turns off. All cables from the TP to the control box appear to be correctly plugged in. Do you know what is wrong? Is it possible to fix without sending the robot to service? It is hard to say what is wrong so you might need to send it to service. My question is not related to this page but I coundnt find a particular page which fits my question. 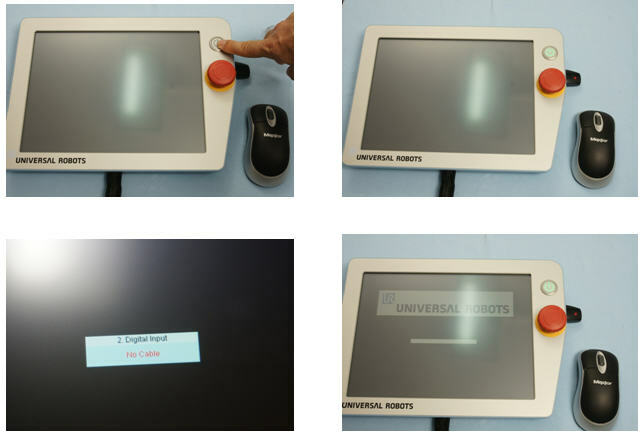 What is the system configuration of the UR5 robot with CB3 controller. I mean how much ram and internal memory does it have? Can I install debian 7 based softwares in UR5 controller and run it in background ?Thanks! I have not seen any informations for the system configuration and I am not aware of if it is possible to install such software as you mention. We have a problem with Power ON the robot. The robot is not getting ON suddenly. 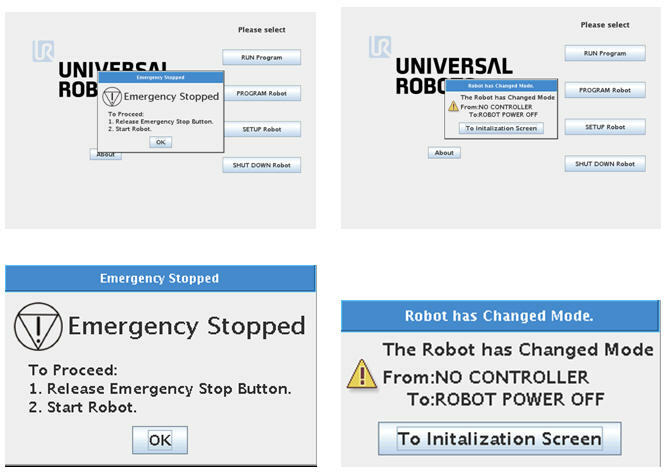 The controlbox status at the Initialize Robot screen shows as “Failure”. So that I couldn’t power ON the robot. I didn’t find any troubleshooting procedure for that. How to fix this? Please help us. If you send us little more detail, it will be helpful. It sounds to be hardware related – maybe try to contact your UR provider for a check.